John Sherry, Director of Client Services at AMP Technologies, a cloud-based real estate asset management platform based out of San Ramon, California, focused his talk on how mobile applications, more commonly referred to as “apps,” are transforming retail.John is a colleague of Craig Wood , who also spoke at #LetsGetSmart. John began his talk with a quote from the great hockey player, Wayne Gretzky. 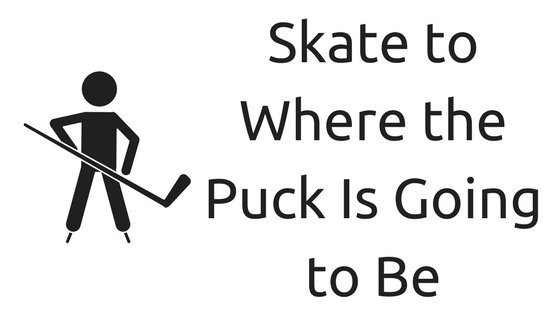 Gretzky once said of his strategy on the ice, “I skate to where the puck is going to be, not where it has been.” John said that for retail, this quote encompasses the idea that apps need to be focused on the future. It is imperative that business team members today think outside-of-the-box as they work to meet consumers’ changing needs. John believes that above all else, apps need to be simple and easy so that every consumer can access them. John cited apps like AirBnB, HotelTonight, and Chewy as being successful because of their simplicity and efficiency. He went on to discuss a statistic that indicated a huge market for apps such as these, stating that “this is the best, most exciting time for apps that retailers could ever have.” On a daily basis, the average person uses eight apps; in a month, the average person uses about thirty. Thus, the opportunity certainly exists for retail industries to capitalize on the popularity in general of smartphone apps. John said that for retailers, the key is thinking about what consumers need and how to deliver it to them before they even realize their own need. John discussed one app, PricePatrol, that allows a person to look for a product in his or her area and compare which retailer has it closest and cheapest (with the goal being to make the product more accessible to the consumer than even Amazon’s 2-day shipping could). John applauded this app as something that is quick, simple, and easy to use. John also believes businesses should strive to use apps as a way to enhance the customer experience. BestBuy, for example, has created an app that allows the consumer to scan QR codes, compare prices, and track purchases in a simple way, thus improving the customer experience through an app. Likewise, the Target app allows customers to set up registries for weddings and baby showers by simply walking around the store and scanning items that they would like. In this way, John believes Target is creating an experience for customers that is simple yet fun. When asked what his favorite application is, John pointed to PipeDrive, a simple, easy-to-use app that can track all of a company’s deals, contacts, and communication. He also cited HubSpot as a favorite, noting one particular aspect of the app that allows users to schedule emails that need to be sent in the future so that the user does not forget about them. In conclusion, John said that in this day and age, companies need to be mindful of creating cohesion within their platforms. “All the channels matter so it’s just not going to be apps that matter, it’s going to be store, online, and mobile,” John said, echoing the same ideas of the other speakers from #LetsGetSmart17. UPDATE: Other Than Social Media, How Often Do You Use Apps For Business?